NOTE: The application period for this position closed in February 2019. Are you interested in a career in sustainability? Are you a people person with a passion for teaching others about how to care for the environment? Do you have experience working with multiple groups and volunteers on energy efficiency? If so, then you might be interested in being our next sustainability outreach specialist. This position will be at our UF/IFAS Extension and Sustainability office in Sarasota County at Twin Lakes Park. 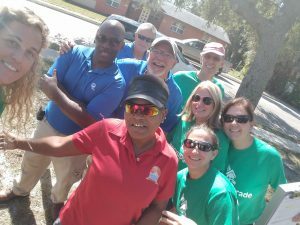 The Energy Upgrade volunteer program – working with our volunteer energy coaches to do energy and water efficiency upgrades in low-income housing units. The Partners for Green Places grant project – a partnership between numerous organizations that will allow local non-profits to assess and implement energy efficiency measures in their buildings. Annual Sustainable Communities Workshop – coordinating and planning a one day conference on sustainability priorities. Sustainability Classes: coordinating and teaching sustainability training and classes on priority topics, with a particular focus on energy, electric vehicles, green building, and sustainable living. Communication: Writing blogs, newsletters, and social media posts about sustainability topics. Learn more and apply through the Sarasota County job posting. Learn more about our sustainability program here. I am very interested in the position of Sustainability Outreach Specialist but did not find any application link from the website. I graduated from the University of South Florida, master of Global Sustainability. I have several professional sustainability project management experience. If this position is still open, can you please send me the apply link or I can provide my resume and cover letter from email. Please let me know if you need any further information, and expect to contact in the future. Good morning, Dongyi. Congratulations on your academic achievements, and we thank you for your interest in joining us at UF/IFAS Extension Sarasota County. Unfortunately, the application period for this position closed in February 2019. You can, however, find currently available positions at UF/IFAS by visiting http://personnel.ifas.ufl.edu/jobs.shtml or at Sarasota County by visiting https://www.scgov.net/government/career-opportunities. Best of luck!